In this guide we will cover how to setup the Event Espresso Arabica theme. For this guide, you’ll need to have an SFTP or FTP client as well as login information to access your WordPress root. Cyberduck and FileZilla are both free FTP / SFTP clients and are available for multiple platforms. Your login information is available from your web host. Now upload the Espresso_Arabica_2014 folder to your WordPress themes folder above. After the upload has completed, login to your WordPress Admin. Locate Appearance in the WordPress admin menus and then click on Themes. This will take you to the themes page. 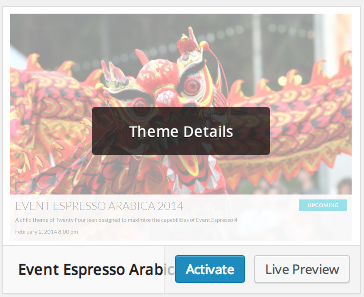 Locate the Event Espresso Arabica 2014 theme and click on Activate. Then return to the front end of your site and head to your events list page to see your new theme in action.